Mufasa, also known as King Mufasa, is a lion in the 1994 animated feature film The Lion King. 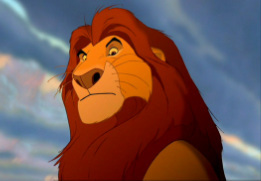 He is Simba's father, Sarabi's husband, and Scar's older brother. He is also the grandfather of Kiara and the father-in-law of Nala. Fate: Pushed off a cliff into wildebeest stampede by Scar, trampled to death; later reincarnated as a ghost who serves as a guide to Simba. Quote: "Look inside yourself, Simba. You are more than what you have become. You must take your place in the Circle of Life." A huge, powerful male lion, Mufasa is the King of the Pride Lands at the start of the The Lion King, father of Simba, and mate of Sarabi. He is shown to be a wise and fair ruler, who follows the "Circle of Life". However, his brother Scar is jealous of Mufasa's position as king and forms a plan to kill Mufasa and Simba, who is Mufasa's heir, so he can be king. Mufasa is ultimately portrayed as an "ideal king", strong, powerful, and kind-hearted, which is contrasted to the deceitfulness and lust for power of Scar. Later, Mufasa takes Simba through the kingdom, teaching Simba about the responsibilities that Simba will have as King. He notes that everything they see is part of the kingdom, with the exception of the Elephant Graveyard, which Mufasa explicitly forbids Simba from going to. However, during their talk, Mufasa is called away to deal with hyenas in the Pride Lands. Meanwhile, Simba travels to the Elephant Graveyard, after being manipulated by Scar, not knowing it's a plot by Scar to kill him. Scar's first attempt to kill Simba through the hyenas is foiled when Mufasa, who had summoned by Zazu, rescues him. Afterward, Mufasa scolds his son for disobeying him. He then takes time to teach Simba about the Great Kings, who will guide him. Meanwhile, Scar, angered by the failure of his plot, makes a plan to kill both Simba and Mufasa with the help of the hyenas. Mufasa is seen the next day, pointing out to Zazu a migration of a wildebeest herd that is said to be unusual. Scar appears and reveals that Simba is trapped in a gorge with the wildebeest, and Mufasa rushes to rescue Simba, not knowing it's part of Scar's plot. Mufasa successfully saves Simba, but struggles to climb up a cliff to safety. Scar, waiting for him at the top, pierces Mufasa's paws with his claws, pretending to help Mufasa. But Scar lets go after saying, "Long live the king". Mufasa falls off the cliff, and dies as a result. Simba is manipulated by Scar into believing that he caused Mufasa's death, and runs away from the Pride Lands. Several years later, Mufasa appears as a ghost. Rafiki, having discovered Simba's survival, finds Simba in an attempt to convince the now adult lion to return to the Pride Lands. Rafiki takes Simba to a small, magical pool which brings upon Mufasa's ghost, up in the sky. Mufusa tells Simba that as his son and rightful heir, Simba must remember who he is and return to the Pride Lands. This encourages Simba to return to his homeland, where he defeats Scar and takes his rightful place as king. In the final scene of the film, Mufasa (again in the clouds) says, "Remember" as Simba stands triumphantly on Pride Rock to claim the throne.